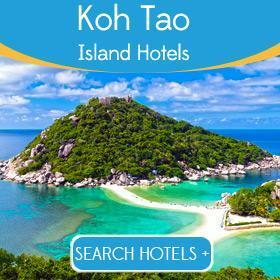 The quality of accommodation, high standard of service and our fast track approach to the cheapest deals means booking from our list of the best 4 star hotels in Koh Samui have the makings for an exceptional holiday. At the same time we realize that if your resort is not located directly on the beachfront a tropical island vacation is simply incomplete. You will therefore be delighted to know that each of our chosen hideaways are located amid breathtaking surroundings steps from a palm tree lined ribbon of sand. Most importantly is choosing the right location at which to spend your holiday time and which resorts feature the facilities you require. You may for example enjoy the peaceful mood of Choengmon, Maenam or Bophut, but if you prefer a vibrant scene and electrifying nightlife our 4 star accommodation in Chaweng or Lamai beach 10 minutes further south deserve a closer look. 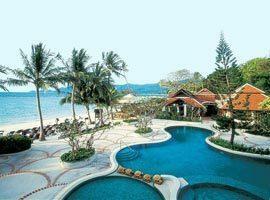 As for the facilities you will find detailed list of what you can expect when you click on each hotel. 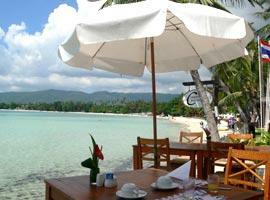 Banana Fan Sea is in Chaweng Noi where you can enjoy peaceful tranquility, yet be near shopping, dining and nightlife. 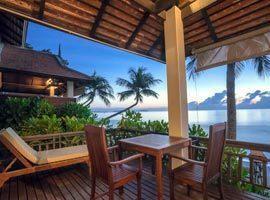 It offers suites and villas right on the sandy shore including a 2 bedroom villa. Features the trendy ocean club with private cabanas, oceanfront infinity edge pool and DJ to entertain while you relax. Suites and villas have a crafty design, private pools and all have kitchens and living areas. 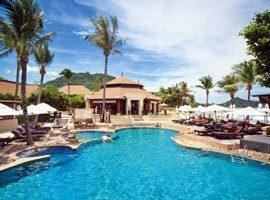 Ideal honeymoon resort located minutes from entertainment in Lamai. You can relax unhindered on a private beach, swim in your own private pool and enjoy stunning views from your villa's sun deck. Choose from family rooms, honeymoon suites or villas spread out through tropical gardens. This seaside haven offers a spa with an extensive treatment menu and an oceanfront pool and restaurant. 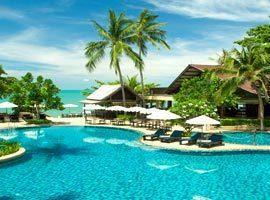 Chaweng Regent is located on a white swath of sand within walking distance of restaurants, shops and other entertainment. 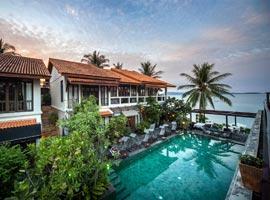 Offers a romantic spa villa suite and premier room with lounge. Wrapped in tranquility you can choose from superior ocean view rooms, ground floor superior garden cottages, a deluxe room with adjoining lounge or Impiana suite with outdoor deck and sea views. 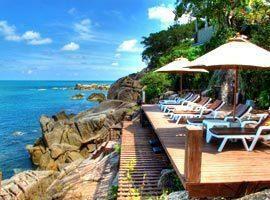 Romantic setting in a quiet corner of Lamai, yet offering quick access to nightlife and restaurants. Soak in seclusion and sip champagne in your private pool or jacuzzi. 2 and 3 bedroom villas available. Magical oceanfront setting in Bophut near the popular Fisherman's Village where you can shop, dine and wine in a quaint and historical atmosphere or enjoy BBQ's on the beach at the resort. 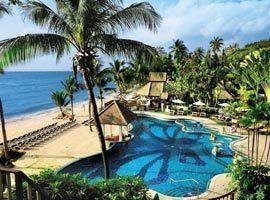 Beachfront hotel with oasis-like setting bordering 3 private sandy coves in Lamai Beach. There is 2 bedroom suites for families and couples will find the beachfront suites romantic hideaways. With a great guest reviews you can book with confidence and the amazing beachfront location in the south of Chaweng means you are near the primary entertainment, but will enjoy peaceful serenity. 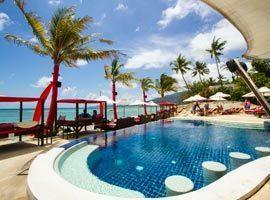 For guaranteed ocean views the all ocean facing rooms at Kala Samui in Chaweng Noi are ideal. 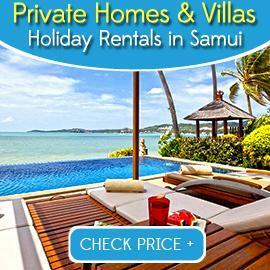 Offers suites and private pool villas including 2 bedroom accommodation with direct beach access. With an elegant old world charm appeal The Scent offers romantic accommodation featuring rooms with glorious views across the ocean. 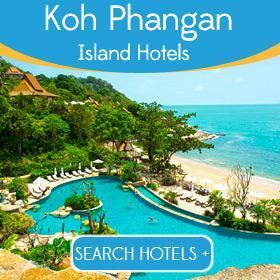 It is located in Bophut near the charming Fisherman's Village.